An independent engineering firm has determined that Kaman’s proven SMT-9700 inductive sensing system, designed specifically for Original Equipment Manufacturers (OEMs), has a Mean Time Between Failures of over 30 years. States Dan Spohn, Kaman Marketing Manager, “With an MTBF of over 30 years, the SMT-9700 will provide a reliable output that, in most cases, will outlast the OEM's equipment." The SMT-9700, a compact, high-performance position/displacement sensing system, is based on Kaman’s proprietary inductive technology. It provides a non-contact, cost-effective solution with reliable, repeatable performance over the OEM product’s lifecycle. The SMT-9700 is ideally suited for applications and environments ranging from photolithography stage positioning in semiconductor clean rooms to position feedback in the fluid-drenched environment of bearing race precision grinding equipment. Kaman offers the RoHS and CE compliant system in 1, 2 and 3-channel configurations with 13 sensor options covering full-scale ranges from as little as 100 microns up to 25 millimeters. 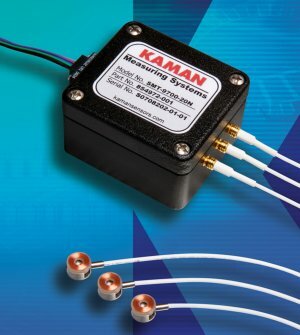 In addition, Kaman can customize the sensors themselves to meet the particular physical and environmental constraints of the application, calibrating the sensors to a specific target material, size, and shape to complete the tailored solution. With all inquiries, Kaman’s experienced applications engineers will review the performance requirements — considering the calibrated range, linearity, thermal sensitivity, resolution, and repeatability required — and recommend the appropriate system for the application.